BMW, R7 Concept Motorcycle, 1934. Photo: Peter Harholdt. 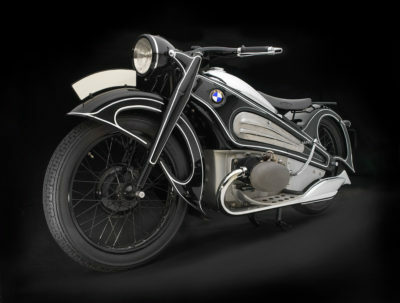 BMW’s sleek, streamlined, one-of-a-kind R7 Concept Motorcycle appeared at major shows in Germany in 1934, then was crated up and lost until it was discovered in 2005, and restored by BMW craftsmen. Highly advanced for its day, with a pressed steel frame and full bodywork, the R7 is a remarkable survivor—and a bike that was well before its time. Chrysler Thunderbolt, 1941. Photo: Michael Furman. 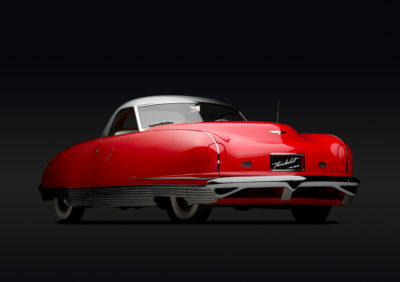 With its smooth, aerodynamic body shell; hidden headlights; enclosed wheels; and a retractable, one-piece metal hardtop (an American first), this stunning roadster hinted that tomorrow’s Chryslers would leave their angular, upright, and more prosaic rivals in the dust. Dramatically modern, the five Thunderbolts built were critically-acclaimed, but a high price tag deterred buyers. Some of the Thunderbolt’s advanced features found their way into post-WWII production Chryslers. The Portland Art Museum is pleased to announce The Shape of Speed: Streamlined Automobiles and Motorcycles, 1930–1942, a special exhibition debuting at the Museum in Summer 2018. Featuring 19 rare streamlined automobiles and motorcycles, The Shape of Speed opens June 16 and will be on view through September 16, 2018. The concept of streamlining has fascinated people for generations. Beginning in the 1930s and extending until the outbreak of the World War II, automotive designers embraced the challenge of styling and building truly streamlined cars that were fast and fuel-efficient. They were encouraged by the confluence of aircraft design with the sleek shapes of fast railroad locomotives; new advanced highways such as the Autobahns; and events like the 1939 New York City World’s Fair, which showcased futuristic design. The Shape of Speed presents a select group of rare automobiles and motorcycles that demonstrate how auto designers translated the concept of aerodynamic efficiency into exciting machines that in many cases, looked as though they were moving while at rest. The Museum will display 17 cars and two motorcycles—the best of that era’s streamlined offerings—from Europe and the United States. Engineering drawings and period photographs will show some of the aircraft, railroad, ship and yacht designs that influenced the automakers. Featured designers and engineers include European streamlining pioneer Paul Jaray, along with Richard Buckminster Fuller, Norman Bel Geddes, Raymond Loewy, Harley J. Earl, Hermann Ahrens, Georges Paulin, Joseph Figoni, Dr. Wunibald Kamm, Otto Kuhler, Jean Bugatti, Hans Ledwinka, Gordon Buehrig, and others. In contrast with the decades following World War II—when advanced aircraft and rocket designs propelled carmakers toward fanciful and impractical designs—the automobile designs in the pre-war period were more organic, emulating the classic teardrop shape thought, at that time, to be perfect for cheating the wind. The results were brought to life in cars with then-startling shapes that looked as though they were ready to be embraced and caressed. Even if they weren’t noticeably faster than their predecessors, they looked fast. In a few cases, the conservative public balked. Sales of well-known brands slipped, then recovered as consumers tentatively embraced and then accepted this brave new look. 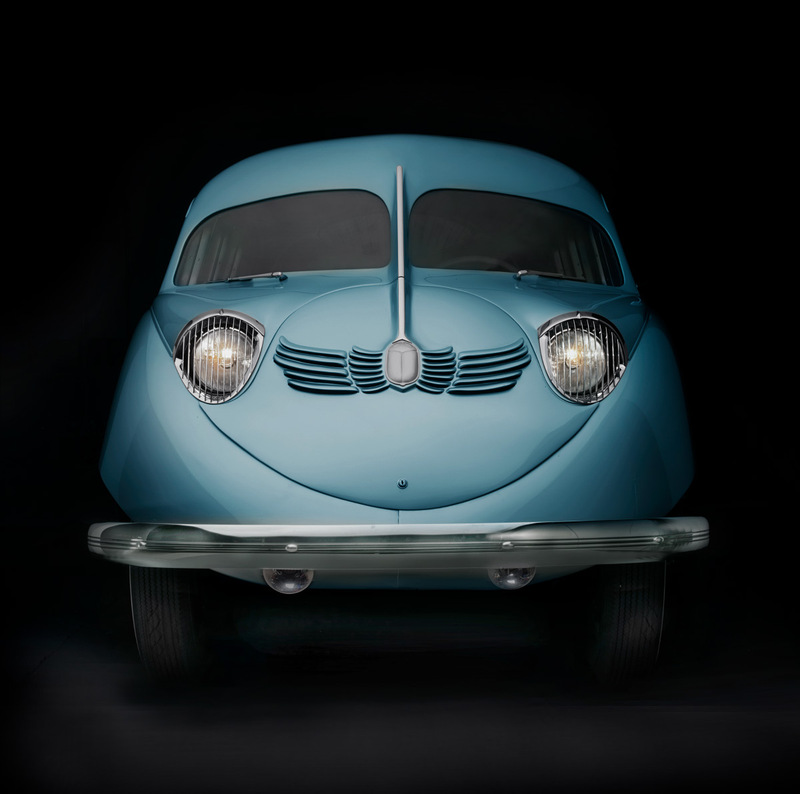 The design influence of streamlining was felt far beyond automobile styling in this period. The school of architecture now known as Streamline Moderne had an effect on the shape of radios, appliances, transport trucks, and railroad locomotives, along with such disparate items as table flatware, water pitchers, toasters, pencil sharpeners, and cocktail shakers. A few of the automotive marques featured in The Shape of Speed include Mercedes-Benz, who have restored one of the carmaker’s Stromlinienwagens (streamlined cars) from 1938, along with Bugatti, BMW, Alfa Romeo, Voisin, Talbot-Lago, Delahaye, Cord and Chrysler. In addition, The Shape of Speed includes two motorcycles: a radically streamlined Henderson KJ and a BMW concept R7 motorcycle that was developed in the mid-1930s, lost for decades in a missing crate, recovered in 2005, and completely restored. The latest exhibition in the Portland Art Museum’s design series, The Shape of Speed is guest curated by Ken Gross, former director of the Petersen Automotive Museum in Los Angeles. Gross previously curated the Museum’s 2011 exhibition The Allure of the Automobile, which enthralled visitors with its lavish presentation of automobiles as kinetic art—a form of rolling sculpture. With this new exhibition, the Museum opens the door to another fascinating exploration of automotive design. The Shape of Speed: Streamlined Automobiles and Motorcycles, 1930–1942 is accompanied by a range of related programs and events, as well as a catalogue. For more information and updates, please visit portlandartmuseum.org. Organized by the Portland Art Museum. Guest curated by Ken Gross.